I’ve always liked to start the week with a light and healthy diner to make up for letting myself go on the weekends. Today’s meal is a green salad filled with nutrients. 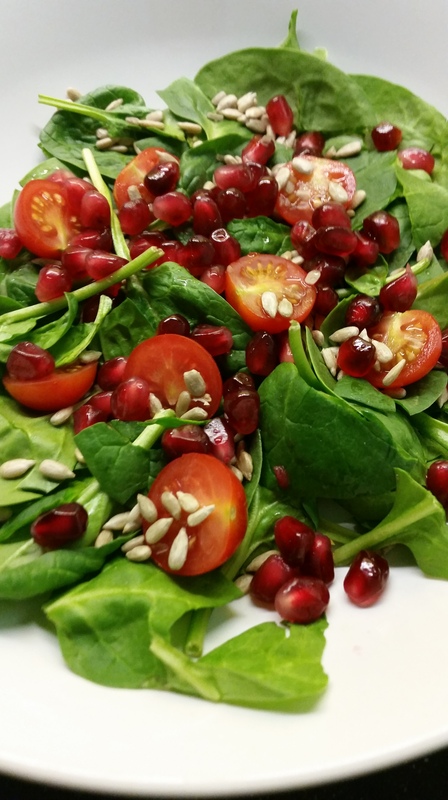 Spinach is rich in antioxidants and is a good source of vitamins A, B2 and C as well as a good source of iron which for some reason I lack a lot of… On top, I cut some cherry tomatoes to get some fiber and they are beneficial for the heart function and lowering cholesterol. I also added some pomegranate which support bone structure and is a good metabolism booster. Finally, I sprinkled it all with sunflower seeds which are very rich in fiber. The all eaten with a bit of olive oil and salt, because I’m a salt addict! If there’s no salt I can’t enjoy my meal, but I’m working on cutting down on my salt intake. Hope you enjoyed reading about my healthy Mondays, leave comments with your Monday recipes!